It’s much more personal to send a thank you card after Christmas, rather than an email or Facebook message. I decided to make my own, using the Altenew Oriental Orchid stamp set. I started by die cutting a square smaller than my 4 inch square card base. Using Versamark ink, I stamped three of the orchid flower outlines in one corner, then repeating the stamping in the opposite corner. I heat embossed them with gold embossing powder. I attached this to the card base. 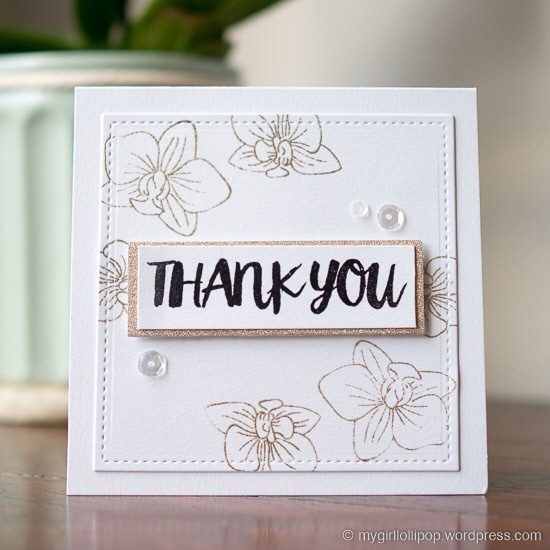 I used the thank you sentiment from the same stamp set, stamping it first in black Versamark ink, then heat embossing with clear embossing powder. I layered the sentiment on gold glitter paper (this is the most gorgeous glitter paper ever! ), then I added to the card using foam tape. Some sequins finished off the card. This is a simple card so it would be easy to make several of them at the same time. With a different sentiment, it would make an elegant wedding card, too.